The Crystal Cave — known to many as La Cueva de Los Cristales — is buried 300 meters below the Earth's surface, sequestered away in the Naica ore mines of Chihuahua, Mexico. Bursting from the top, bottom, and sides of the cavern's walls are otherworldy outcroppings of gypsum crystal. Many are too big to wrap your arms around. Others extend over thirty feet in length. You would think that geological features of such superheroic proportions would have to grow at a pretty prodigious clip to achieve the title of world's most colossal crystals, but you'd be wrong. 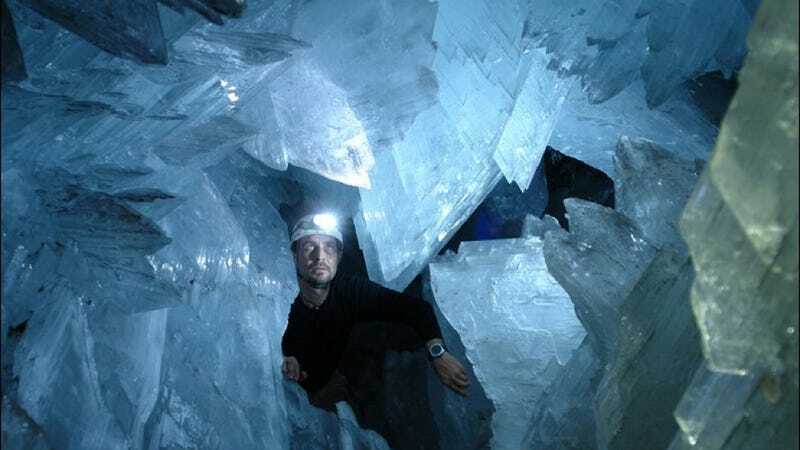 Because it turns out the shard-like spires of the Crystal Cave are not only the largest on record — recent findings reveal that they also exhibit the slowest rate of growth. The discovery was made in 2011 by a research team led by Spanish geologist Juan Manuel García-Ruiz, who measured the gypsum beams with "an advanced high-resolution white-beam phase-shift interferometry microscope;" which is another way of saying his scope was custom-built, and ultrasensitive. "The slowest measurable growth rate was found [in water measuring] 55 °C," write the researchers in the paper describing their findings, published in the Proceedings of the National Academy of Sciences. Using their high-resolution awesomescope, the team was able to observe a crystal sample growing at a rate of just 0.000000000014 millimeters per second. In other words, if you took a picture of the crystal today, left, then returned to the cave 16,000 years later and took another picture, you could compare your photographs and see that the crystal had grown a whopping 7 millimeters in length (about the width of a pencil). Aren't geological timescales fun? The team's results, the researchers write, "demonstrate the usefulness of applying advanced optical techniques in laboratory experiments to gain a better understanding of crystal growth processes occurring at a geological timescale." Which really makes sense, if you think about it, because for as beautiful as The Crystal Cave is, it really pays to spend as little time there as possible. Why? Because it turns out the same conditions that are conducive to slow and steady crystal growth (i.e. well over 100 degrees Fahrenheit at 99% humidity) also happen to be conducive to, you know, heat stroke. "You're in the house of Superman," said García-Ruiz, describing the cavern to Discover Magazine. "But if you stay for half an hour, you die."